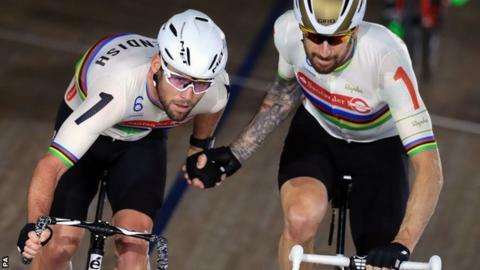 Sir Bradley Wiggins refused to confirm whether he plans to retire after winning the Ghent Six Day event alongside fellow Briton Mark Cavendish. Wiggins, 36, had hinted the race in the city of his birth could be his last, but afterwards said he was "not sure yet" what his plans are. "I don't know, I've still got really good legs," he said. "This might not be my last race. This for sure is my last ever race with Mark Cavendish, though." The 2012 Tour de France winner added that he "just wants to enjoy this moment". Wiggins' admission follows his comments after last month's London Six Day, when he hinted he could be tempted to race there again next year. Wiggins and Cavendish claimed overall victory in Ghent after winning the final madison event. The pair also contested the Ghent Six in 2007 and won madison gold together at the World Track Championships in London in March. They competed together in the madison at the Beijing Olympic Games in 2008, finishing joint eighth. "We've had an incredible 12 years and have achieved so much together. It's been a pleasure," Wiggins added.